I really wanted to use this sweet new Lockhart Ornament Angel but needed my main panel to be a longer rectangle to fit the sketch. Then I spied the new Itty Bitty Ornaments . . .
. . . and decided to put the two together, to make a busy little Angel (a Stamp-A-Ma-Jig is your best friend)! The Angel panel (5-1/2" x 1-7/8") is matted with Prism Blush Red Dark cardstock and mounted to beautiful Starry Night paper from Webster's Pages Winter Wonderland Collection. Card base is also Blush Red Dark, measuring 9" x 3-7/8" so the card will fit in a standard #10 business letter envelope. Now, on to the sentiment part of this sketch . . . I looked through my JustRite Stampers inventory, remembering a new Christmas Stamp Ensemble, and found this beautiful round "Season's Greetings" that I decided to make into an ornament! These new JustRite products are available for preorder at the JustRite site and should be shipping mid-September. Or you can get them through some of your favorite online retailers: Flourishes & Taylored Expressions. Spellbinders Nestabilities Classic Circles (middle size in the large set) was a perfect fit to cut out this sentiment. For the topper of my ornament, I crimped some gold metallic cardstock, scallop cut the bottom and adhered it to the top of my sentiment circle. I couldn't find any ornament hangers without having to go to the attic (and I definitely wasn't going up there in this 90-degree August heat! ), so I bent a paperclip into the shape I needed and threaded it through a hole in the top of the ornament! Some more Poinsettia Dew Drops accent the cardfront. To see some more inspiration for this sketch, please visit these talented stampers' blogs: Beate, Cambria Turnbow, Charmaine Ikach, Jenn Balcer, Laurie Schmidlin, Lori Craig and MaryJo Albright. I hope you'll try the sketch this long holiday weekend and enjoy it! Kids started school on Monday here and the week has flown by already! I started this card over the weekend and am just now finally getting it all finished . . .
Fall is everywhere in the stores and it's my favorite season, so I was especially happy to see this beautiful new Lockhart Harvest Candle stamp and couldn't wait to color it! The "Thanks A Bunch" sentiment is one of my favorites by Karen Lockhart. I cut and matted the image with Spellbinders Labels Two die (available next month) and sponged the edges with Ranger Vintage Photo Distress ink. The image is mounted with dimensional foam tape to the card. I used CPS79 for the layout for this card, turned on its side. The 5.50" card base is Stampin' Up's Chocolate Chip. These beautiful papers are from MemoryBox's Grove collection. I distressed the edges and then sponged some Vintage Photo ink over the top swirls that were a little light for what I wanted for this card. The swirl is Spellbinders Doodle Parts die, cut from Neenah Classic Cream and sponged with Vintage Photo ink. It's popped up on dimensional foam tape and has some Neutral, Spring & Summer Art Flowers added. Aged brass flower brads are Making Memories. All products (except MM brads) available now or in the near future from Ellen Hutson LLC. I'm off to stamp and create again . . . I'll be back soon! Birthdate: 7.6.08 (7 wks); Weight: 7 Lbs; Height: 10"
What you can't see in this photo (buried in the grass) are his huge paws . . . he'll be growing into them, as he's a Great Dane! And yes, we've had one before and know what to expect from them. They think they are lap dogs, will sit on the sofa just like a human and crawl up into bed with you when you are sound asleep! When taller (at about 1 year), they can drink from the kitchen or bathroom sink and also make a snack out of anything you might happen to leave out on the kitchen counter! But they are the friendliest buckets of love you'll ever find and amazingly, very gentle with children. Watch out for their bark -- most of the time, it's worse than their bite! The girls had been begging for a dog for a while and seriously, who could resist that face? A friend told me I had no backbone at all, LOL! So if I'm not here, I'll probably be training or walking the new puppy or buying more food for him . . . hopefully I'll still be able to squeeze in some crafting time! Have a wonderful weekend! After a summer break, it felt great to get back into the routine of our Friday Weekend Sketch Challenges from Beate. I hope you'll join us, too, and try this sketch! My black card base is 5.50" and the patterned papers are a specialty pad (glittered & flocked) by K&Company. I used Spellbinders Nestabilities Classic Circles to cut & mat my circle element. The left vertical element was another pattern of striped paper from this pad that I zig-zag stitched. I cut out the flocked spider from another pattern of this paper and used him as my right vertical element; he's popped up on dimensional foam tape. I intentionally made the shadowing around the clothes a little darker, to make them seem gloomy. Another bit of zig-zag stitching finishes off this image. You can check out some more wonderful ladies' blogs to see their interpretation of the sketch . . . I'm sure they'll knock YOUR clothes off! Beate, Cambria Turnbow, Charmaine Ikach, Jenn Balcer, Laurie Schmidlin, Lori Craig and MaryJo Albright. Have a wonderful weekend! I wanted to share a few details about a scrapbook page I've been getting some questions about that was shown in Ellen Hutson's emailed newsletter on August 15th. If you are not signed up to receive Ellen's newsletter, you can do so by going to her home page . . . scroll down to the bottom and enter your email address to join her mailing list. The schoolhouse from Kim Hughes' darling Making The Grade set (from Cornish Heritage Farms) was stamped with Ranger's Adirondack Red Pepper dye ink onto Neenah Classic Natural White cardstock and then shaded with Copic markers W3 under the roof eaves and T5 for the door and round window. And no, mixing the two inks will not cause either to bleed -- a very nice discovery with lots of possibilities! The bell was colored with silver Copic Spica glitter pen and the white parts accented with Ranger white opaque pen. The schoolhouse was cut out and popped up on dimensional foam tape above an area I sponged with Vintage Photo Distress Ink. He was colored with Copic R27 and then the 0-Blender pen was used to create the wiggly pattern. Copic's blender pen actually takes color away or "erases" the Copic color you've already layed down on your cardstock, thereby creating the lighter shaded pattern! The same technique was applied on the book pages. Both stamped images were cut out and adhered to the Spellbinders die cut star. The worm is popped up on dimensional foam tape and his hat & eyes were glittered with black Copic Spica glitter pen (which isn't showing up too well in the photo). All products available from Ellen Hutson LLC. It's time for another SplitcoastStampers.com design team & alumni challenge. This month, the "What's In A Number" challenge was to make a birthday card with numbers on it but the restriction was that we couldn't use the word "birthday". You know I love a challenge (I think it inspires creativity and promotes thinking outside your normal "box"), so I immediately thought of all the number stamp sets I have in my JustRite products. Here's the birthday card I came up with for my brother . . . you know, the one that was always mean & rotten to me when we were growing up? I'm sure you probably had a sibling the same way and can relate! The folks at JustRite will probably cringe if they see that I cut apart their stamp! This is the wood stamper turned upside down. You see those horizontal grooves on the stamper? Those are also on the backs of the JustRite stamp images and that's how they "snap" onto the stamper and stay secure while you stamp. The oval "Dream" usually fills up that entire center oval but I cut blank parts of the "Dream" oval away to reveal the grooves in the stamper underneath, so I could place the "44" (from the Brayton font) at the top and "of being young again" (from the Small Letter Set) underneath "Dream". Then I inked parts of the stamp separately -- Dream and the star with Tsukineko's VersaMagic Pumpkin Spice and the 44 and outer oval stars with VersaMagic Jumbo Java. These little Dew Drop ink pads make it very easy to ink separate parts of a stamp and work very well with the JustRite products. I stamped the image onto Neenah Classic Cream cardstock. I cut the oval with Spellbinders' largest Classic Oval Nestabilities from the small set and matted it with chocolate cardstock cut with the largest Classic Scalloped Nestabilities from the small set -- I was thrilled to see they were a perfect fit! I inked the edges of the sentiment oval with Ranger's Vintage Photo Distress Ink and then pierced the center holes in each of the outer stars. The oval sentiment was mounted with dimensional foam tape to the 5.25" square card base I created with BasicGrey's Archaic papers (<= another little play on being old)!! I used Stampin' Up's jumbo brass eyelets to make a left-hinged card. Finally, I thought the bottom of the card could use something to balance out the large oval, so using the Small Letter Set again, I put together a line of "* happy * happy * happy *" and stamped onto the paper. Whew, that about finishes up the deets on my card . . . if you'd like to see the cards all my fellow "Dirty Girls" came up with, click here to see them in the SplitcoastStampers.com gallery. If I don't have something else for you tomorrow, I'll be back on Friday with Beate's Weekend Sketch Challenge -- we're resuming after a summer break! I easily adhered a section of this beautiful Webster's Pages patterned paper (Serendipity from the Sweet Charity collection) that has the same green in it as my walls! I thought it would be a perfect fit to display some floral Inchies that I'll gradually be adding to my collection and sharing with you over the next few months. Beacon Adhesives Zip Dry Paper glue worked very well to adhere the paper to the powder coated metal. I sanded the edges of the paper and inked them with ColorBox's Chestnut Roan fluid chalk ink. I found this little bit of bead trim in my stash but it was a yellow/golden color, so I changed it to match my project by airbrushing the beads with Copic marker E27! Some green organdy & satin May Arts ribbon matches the paper and is used to hang the board. The white background of the Inchie square was colored with the E00 Copic and then shadowed & outlined with E25. I really like how well the Copic markers blend on the Inchie matboard square -- it's a wonderful surface to work on and the markers don't "pill" the surface of the matboard. The white flowers in the bouquet were colored with Ranger's white opaque pen. "Relax" is a portion of Karen Lockhart's Sit Back & Relax sentiment. I backed my Inchie with Inchie Magnets, so it would stick to my paper-covered metal Inchie Board. I'll hang this board next to my desk, as a reminder to relax over the upcoming months I know are going to be very busy . . . I hope you'll do the same! I printed off the instructions for this cool project almost a year ago but just recently re-found them and decided to try it this weekend. You can find full step-by-step instructions on Taylor's blog. Taylor made hers into a mini book/album. I was going to make mine into a stationery keeper but ended up with this idea instead . . . a grocery shopping list & coupon keeper! Thanks for the cute idea, Taylor! This is the keeper all folded up, it measures approximately 5" x 7-3/4". It's made out of a regular office supply manila folder. Even though Taylor shows you step-by-step folding instructions, I was a little confused (probably just a blonde thing!) until I actually started folding along with the instructions. So I thought I would show you how I folded mine (in just a bit), with the papers on it . . . maybe that will help with the visualization a little. On the tabs, I used the new JustRite Stamper Brayton font that will be available mid-September (you can preorder it now at the JustRite site), to spell out "Coupon Keeper" and "Shopping List" on my Harmony Rectangle Stamper -- this is a straight wood block that will hold the letters. I love that I can spell out ANYTHING I want with the JustRite products -- not just monograms! I've found fluid chalk inks and VersaMagic inks to work very well with this stamper and on this project I used Dark Brown ColorBox Fluid Chalk cat's eye pad. Papers are from The Robin's Nest. When I was folding this, it just struck me that the pockets would be a good size for most grocery store coupons and the pad of long paper that I usually write my grocery list on will fit in the far right pocket (where I've shown a mocked up "LIST" circle attached to a piece of cream cardstock -- my pad of paper didn't match and look as pretty for the photo!). I used a border from the Elegant Border/Special Occasions set and the 1-5/8" Wooden Stamper with the Times New Roman font to spell out my coupon categories: Meat, Veggies, Bread/Dairy. Spellbinders Nestabilities Classic Circle (third smallest in the large set) is a perfect fit to cut this 1-5/8" stamped image. I used the Nestabilities Classic Scalloped die (second smallest in the large set) to make a chocolate mat. If you use this folder idea to make something, be sure to link back here -- I'd love to see what you create with it! 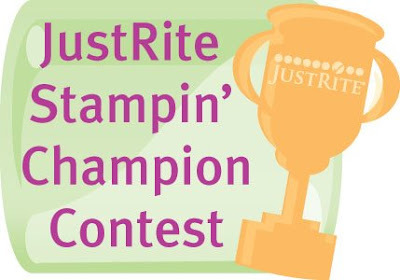 And don't forget to enter the JustRite Stampin' Champion contest . . . in the spirit of the Olympics, there are some Bronze, Silver & Gold prize packages that will be given away! I know it's a bit early to be thinking about Christmas but with school starting, before you know it Halloween will be here and then the holiday season will be upon us. So if that's not justification enough . . . I just got a new box of stamps yesterday and couldn't wait to share these with you! :) Plus, I LOVE the holidays! As shown in order on the card above - Left: Candy Cane Stocking . . . Middle: Christmas Tree Stocking . . .
And this one is Candle Stocking (on the far right in the top photo). All of the stockings are popped up on dimensional foam tape and placed on a coordinating piece of green BasicGrey paper cut with Spellbinders Long Scalloped Rectangle Mega Nestabilities die. This layer is also popped up. "The stockings were hung" sentiment is also new from Lockhart -- I inked parts of it separately and stamped it between the stockings. A piece of red hemp is held in place with silver brads and the stocking hangers are glued to it. Card base is Prism Blush Red Dark. This card measures 5" x 7" but I think I'll find a frame for it, to display this holiday season! Wouldn't these stockings be adorable on a scrapbook page? Supplies: Lockhart stamps, Memento ink, Copic markers, Spellbinders dies & Ink Blending tool all available from Ellen Hutson LLC. Prism cardstock & Distress ink available from Cornish Heritage Farms. You could be the next JustRite Stampin' Champion. The rules are simple...the prizes are terrific. For the complete rules and all the details visit the JustRite blog. Good luck...you may enter as many times as you like and you can win multiple times by just sharing your talent and posting your projects using a JustRite Product in the Splitcoaststampers.com gallery, using the keyword "JustRite". For some fabulous JustRite inspiration, visit Kellie's blog, Polished to Perfection . . . she's been featuring some great holiday projects and is currently on the 4th day of Christmas. Will there be 12 days? Check it out to see! I hope to have another JustRite project right here for you sometime this weekend, too! This rooster is certainly strutting his stuff and I thought it would make a good congratulatory card to send when something special happens in someone's life. Karen Lockhart's Rooster was stamped onto Neenah Natural White cardstock and colored with Copic markers. The background was still a little too white for me, so added Vintage Photo Distress ink with Ranger's Blending Tool. I also distressed the edges of the image and matted it with black cardstock. The yellow layer is MemoryBox Sweet Corn stamped with Cornish Heritage Farms' Pretty Pattern backgrounder in Ranger Adirondack Butterscotch dye ink. Vintage Photo Distress ink was also added to this layer . . . Do you see a pattern here? I was in a distressing mood today, LOL! The card base is a MemoryBox Paprika notecard stamped with Cornish Heritage Farms' Victorian Floral backgrounder in Adirondack Red Pepper dye ink. The red and yellow layers were all sponged with black ink. Now for that pretty black strip -- that's Spellbinders' new Victorian Pierceabilities (available next month) cut & embossed from MemoryBox Licorice cardstock. The nice thing about MemoryBox cardstock is that one side is colored and the other side is white. I used that to my advantage here by lightly sanding the embossed cardstock to reveal the white core. I loved the punched tin vintage look this gave -- I think it really added to the distressed country feel of this card. I finished it off with that cute Lockhart "Strut your stuff" sentiment and three black brads that were . . . you guessed it -- sanded! Supplies: Lockhart Rooster & Strut sentiment, Cornish Heritage Farms Pretty Pattern & Victorian Floral backgrounder stamps. MemoryBox Notecards - Paprika, Sweet Corn, Licorice. Neenah Classic Natural White cardstock. Adirondack Pitch Black dye ink & Copic markers. Spellbinders Victorian Pierceabilities die. Sanding block, Ranger Ink Blending tool & Ornare Piercing Tool all available from Ellen Hutson LLC. After distressing the edges, I mounted the paper to a 6-inch square piece of Stampin' Up Chocolate Chip cardstock that I cut the left edge with Spellbinders' new Victorian Pierceabilities die (available in September). The blue lined paper is the reverse side of this pattern -- I ran a strip of it under my calendar page and used it to cut that cute tiny butterfly. She's from the Flying Beauties Spellbinders die set. The circle sentiment I created myself with my JustRite Classic Wood Stamper (large 1-5/8"). "Classic" just means it's the round wood block instead of the Self Inking Stamper. Originally I intended to ink the round border in a different color than the letters, so that's why I chose the wood block. Obviously, along the way I changed my mind -- good ole' plain chocolate won out! I know you'll ask what those black marks are on the sides of the wood block, so I'll go ahead and explain: I use them as a guide to help me stamp straight, when it matters. Since I was using this lined paper, I wanted to try and line things up a bit. I used JustRite's new Brayton font (green letters on the left) to create my sentiment but by the time I got to the end of "Create", I had used too many E's and ran out! I've always loved mixed font sentiments, so I decided to replace a few of the E's with JustRite's (also) new Trompe script font (red letters). It looks like these new fonts will be available in mid-September but you can pre-order them now at the JustRite site. Then I stamped with Adirondack Espresso ink onto the blue lined paper. I used my Spellbinders Nestabilities Classic Circle (3rd smallest in the large set) to cut out the stamped image and then used Spellbinders Nestabilities Classic Scalloped Circle die (2nd smallest in the large set) to cut a chocolate mat. The calendar was computer printed onto white shimmer cardstock and the edges inked with Vintage Photo Distress Ink. ETA: A link to the downloadable calendar pages I created can be found in THIS POST. If you happen to have missed my other calendar pages I've been making all year, you can click on the Calendars Category or Calendars photo album over in my right sidebar. Whew -- sorry for the long post . . . I'll be back on Friday with another Divine Design project! Another holiday card I made for the Spellbinders CHA booth, using the new Nested Birds� (S4-160) die set that will be available in September.� I know you're probably getting tired of holiday cards, but just thinking about December & winter makes this 100-degree plus Texas�heat a little more bearable!� Plus, if you get a head start now, you'll be ready for the holidays! Paper and jolly crown�are from Fancy Pants' Holly Jolly collection and when I saw that crown, I knew immediately this sweet bird needed it for her holiday parties, LOL!� :-)� It's popped up on dimensional foam tape. The edges of the background paper were distressed and then machine stitched to a Prism Razzleberry Dark� card base.� This makes a pretty simple & easy card that goes together quickly for your holiday sending. I'm still working on that August calendar page and hope to have it for you tomorrow!